Did you know that elderberry is one of the most commonly used medicinal plants in the world? It’s true! Native Americans used the berry as a treatment for infections (1). Ancient Egyptians, meanwhile, relied on it for clear skin. But is there any validity to elderberry’s use in these ways? Research suggests that yes, these benefits exist in more than just folk medicine. It’s is the fruit of the European elder tree (2). Also known as sambucus, is grows not only in Europe but throughout the northern hemisphere and in certain parts of Australasia and South America. Don’t confuse it with American Elder, Elderflower or Dwarf Elder; those are all completely different things. Also, don’t try to go hunting for elderberries on your own in the wild, unless you know what you’re doing. The raw berries as well as the bark and leaves of the elderberry plant are mildly poisonous and can cause stomach discomfort. Elderberry becomes edible when you (or whoever you’re buying it from) refine it, which we’ll get into in a moment. As mentioned earlier, humans have been using this berry medicinally for centuries. More recently, however, researchers observed its medicinal benefits. A 2011 study published in BMC Complementary and Alternative Medicine (3) acknowledges elderberry’s ability to combat influenza A and B viruses. These viruses cause are responsible for what we refer to as the annual flu (4) that affects up to 20% of the population. This study touts itself as the first to observe elderberry’s effect at combatting these viruses. 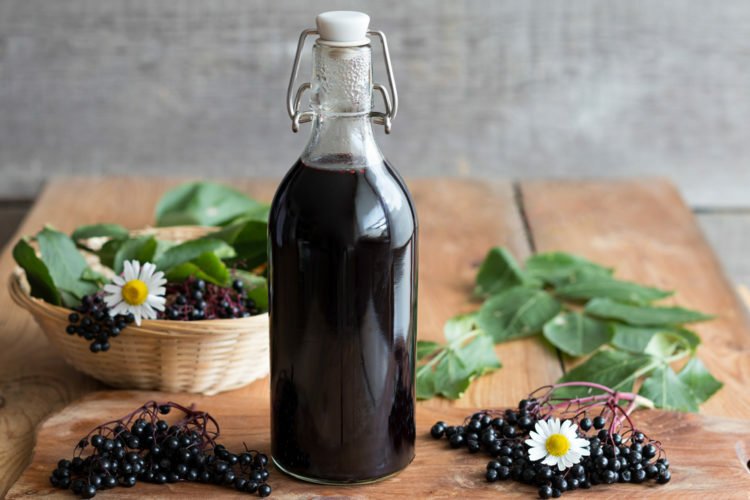 The researchers go on to suggest that, based on their results, elderberry may make a great “additional and alternative” medicine for combatting these infections. It’s worth noting, however, that the researchers behind this study tested the extract against the bacteria on lab surfaces as opposed to within the human body. Through another study (5), however, researchers tested elderberry’s effect on 60 patients. The patients, ages between 18-54, were all suffering from influenza-like symptoms. During the study, researchers gave patients either elderberry extract or placebo syrup four times daily for five days. Researchers observed the patients’ symptoms and noticed that the elderberry extract was able to relieve them an average of four days earlier. Plus, the patients that took the elderberry extract were significantly less likely to have to take medication for their symptoms following the study. 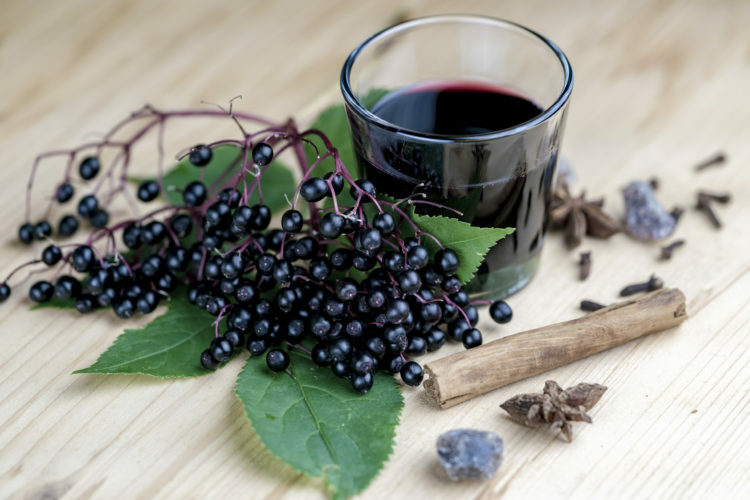 “Elderberry extract seems to offer an efficient, safe and cost-effective treatment for influenza,” the researchers note in their abstract. In yet another case (6), an Israeli virologist tested the extract on patients suffering in the Southern Israel flu epidemic of 1992/1993. Her results provide insight into why it combats influenza so well. Within 24 hours, 20% of Dr. Madeleine Mumcuoglu’s patients saw dramatic improvements in symptoms such as fever, muscle aches and coughing. By the second day, 73% of patients had improved. By day three, that number jumped to 90%. Meanwhile, of the group that didn’t receive the extract, only 16% saw an improvement in symptoms after two days. It took nearly a week before they saw any improvement at all. “To my knowledge, it’s the only product that can cut the flu in half, before complications have a chance of setting in,” said Dr. Mumcuoglu on her findings. Thanks to Dr. Mumcuoglu’s research, we now know that this berry functions by activating the immune system and inflammatory processes that are responsible for fighting off a virus. Subsequent research from the European Cytokine Network confirms this (7), verifying that elderberries trigger inflammatory cytokines that help the immune system. Impressively, these effects aren’t just limited to people who are already infected. Even healthy individuals will receive an immune system boost. Elderberry’s promising effects have led researchers to hypothesize about its potential to combat ailments beyond influenzas. According to some (8), elderberry is rich in flavonoids that block HIV entry. Now, given the aforementioned toxicity of the raw berry, you may be wondering how one should go about consuming this superfood. Not to worry; elderberry is available in a variety of forms (10), including supplements. Supplements are in fact the most common way to consume this superfood. They range in type from capsules to tinctures and lozenges. You can also find the berry in freeze-dried form, which allows you to make your own elderberry medicines. Be sure to share this article with your loved ones if you found it useful! The post Elderberry for Colds: Benefits and Dangers appeared first on DavidWolfe.com. Your Bloating Could Be Water Retention! Here are 5 Ways to Fix it! This Video Shows You How to Peel a Kiwi in 3 Seconds!